1. Student-centered Goals: Adult education programs and their underlying funding streams should respond to the educational and life goals of their participants. Adult learners represent diverse groups with a variety of both intermediate and long-term goals. Participants should be supported in reaching their full potential as community and family members. 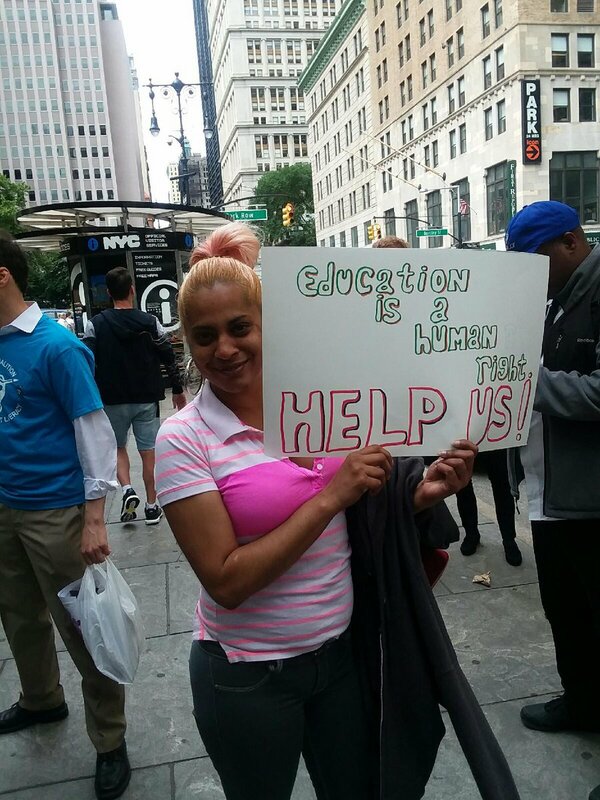 In New York City they include English language learners, out-of-school youth, parents, retirees, the unemployed and underemployed, and the formerly incarcerated, among others, each with unique needs. The diversity of student goals addressed in adult education programs should include parent engagement in their children’s schools and educational development, community and civic engagement, employment entry or improvement, citizenship, high school equivalency attainment, transition to college or training programs, interacting with the healthcare system, and integration efforts for senior citizens. Achievement of these goals produces intrinsic benefits to students and their families, while providing critical benefits to the civic and economic development of the city itself. Adult education programs often serve as entry points for learners who subsequently identify additional goals to promote their families’ economic and social well-being. Employment-related outcomes are one of many goals requiring investment in adult education, but should not be the sole measure of program effectiveness. 2. Access: The diversity of adult education providers in New York City is a great strength and allows community members to access the most appropriate services to achieve their goals. 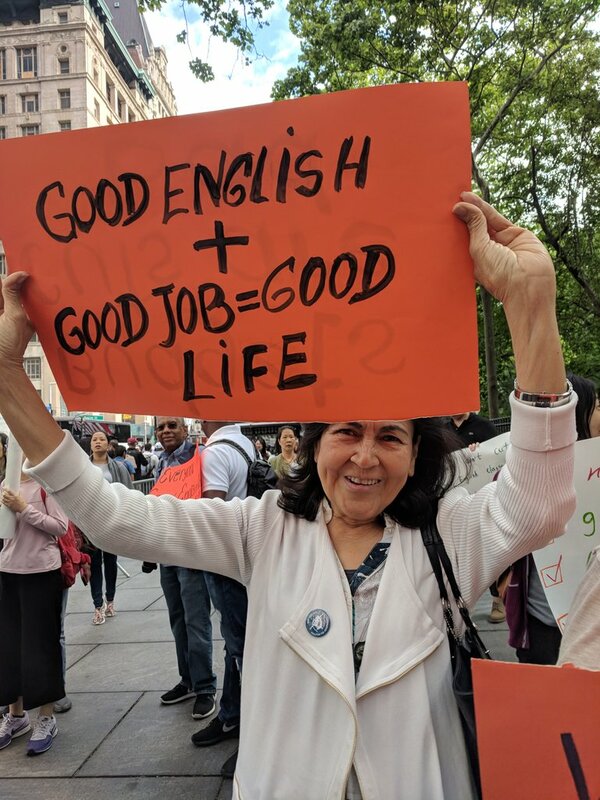 Adult literacy instruction in New York City is provided by a range of different institutions, including the public libraries, the City University of New York, the Department of Education, community-based organizations, and other non-profits. This diversity of program providers is a strength of our system, allowing programs to serve students with a wide range of different needs in a variety of geographic locations. Accordingly, the varied needs of New York’s adult learner community require funding streams that are open and accessible to a wide range of providers, and reflect and support multiple goals on the part of participants. 3. Transparency: Public funding for adult education should be provided through transparent Request for Proposal (RFP) processes that take into account providers’ ability to offer effective adult education services, the geographic needs of community members, and should incentivize agencies with a proven track record of success. Funding processes must be fair and transparent, and should be made available in open competitions. Criteria for funding decisions should be logical and reliant on researched-based best practices. Once decisions are made, a list of awardees with the amounts received should be easily accessible to be public. Organizations that are not selected for funding in those competitions are entitled to an adequate period of time to request an explanation of that decision, along with a prompt and substantive response. 4. Sustainability: Public funding for adult education should be allocated in a timely manner through an efficient contracting process and should promote the sustainability of effective programs through base-lined funding and multi-year allocations. Once funding decisions have been made, all efforts should be made to provide agencies with the fiscal resources necessary to begin and administer those programs according to the standard academic calendar. Months-long delays in funding decisions and allocations adversely affect the provision of services to the community and penalize smaller agencies with less capacity to independently forward fund programs. Base-lined, multi-year funding allocations provide adult education participants with reliable access to high-quality and professionally staffed classes. 5. Accountability: Mandated targets for average daily attendance, instructional hours, educational gains, and goals achievement must correspond to the needs of adult learners, to the best practices in the field of adult education, and be supported by adequate funding levels. Adult education providers should have the flexibility to structure programs according to the specific needs of their communities. While accountability and continuous improvement strategies are critical to maintaining a high quality adult education system, program targets should be based on actual participant goals and research-based objectives. Funding for adult education programs must reflect an adequate rate that covers not only the provision of quality lessons with professional instructors but also the administrative costs of the extensive data collection, data entry, along with the mandated monitoring and evaluation requirements. The rate should support the hiring and retention of full-time faculty, when appropriate, as well as counselors and support personnel whose efforts contribute significantly to student success.